I always find the classics are the hardest to review. 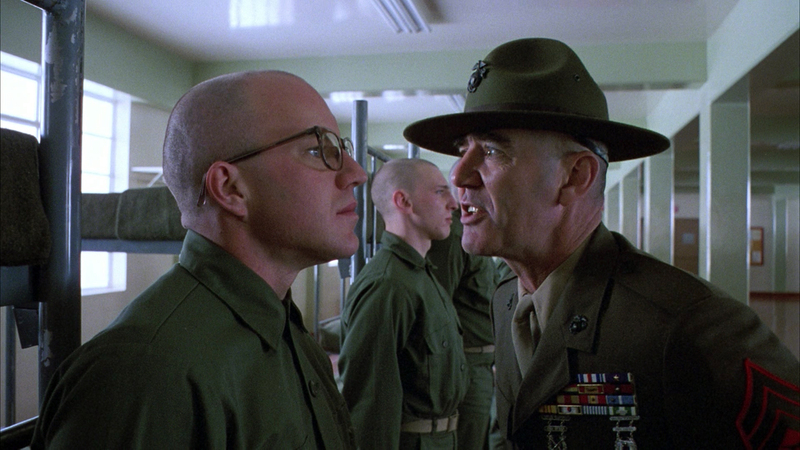 After all, what can you say about Full Metal Jacket that hasn’t already been said? As a film widely believed to be one of the greatest war movies ever made, by adding my own critique to the never-ending onslaught of adoration it’s received in the 26 years since it was originally released, I might as well be spitting into a swimming pool. Still, I recently had the pleasure of watching it again (one of the joys of marrying a non-film buff is getting to re-experience classic movies for the first time through her) and so I decided there’s no time like the present to add my own review to the countless others scribed over the past two and a half decades, especially considering my love for it isn’t quite as strong as its reputation demands. The lengthy opening scene, in which R. Lee Ermey puts down his soldiers with mostly improvised insults, is cinematic gold. 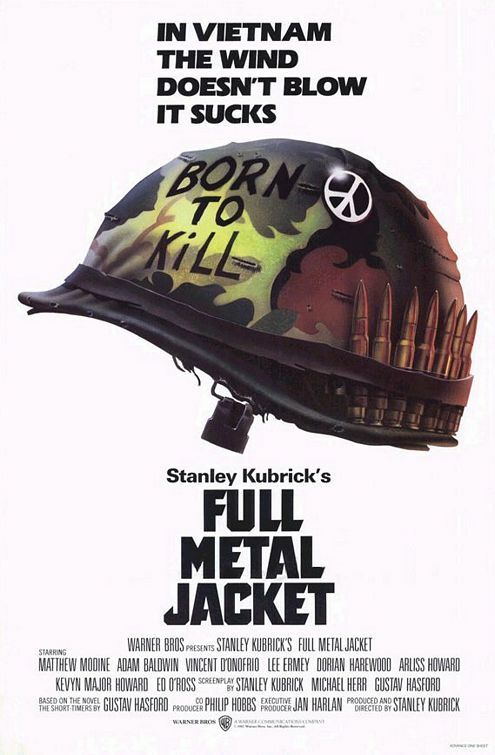 Initially, Full Metal Jacket seemingly follows the military career of Leonard Lawrence, nicknamed Private Gomer Pyle by his gunnery sergeant (perfectly played by real-life sergeant R. Lee Ermey, who was originally only brought in as an advisor and impressed Kubrick so much he was asked to replace the actor already cast). As an overweight, bumbling, slightly stupid chap, Leonard continually angers his sergeant, who tries his best to turn him into an ideal soldier (using the tried and tested methods of screaming and mental abuse) but to no avail. Time after time Leonard fails the tasks set for him, and time after time he’s lambasted for it. Things get even worse when the sergeant starts punishing the entire platoon every time Leonard messes up, which leads to a shocking incident in which they decide enough is enough and punish him in their own way. This in turns leads to a horrendous scene – one of the most powerful and disturbing I’ve seen – which firmly closes the shutters on both Leonard and his sergeant’s further role in the film, if you catch my drift. Unfortunately, by giving Leonard a loaded gun (“seven-six-two millimetre… full metal jacket”), Kubrick also shoots himself in the foot by removing the film’s two most interesting characters by far. Without them the back half of Full Metal Jacket becomes a standard Vietnam film that, while undoubtedly entertaining, never makes you think beyond the typical “war is hell” and “who are the real bad guys here” moral quandries. With Leonard and the sarge out of the way, the focus switches to Private Joker, Leonard’s erstwhile friend at the training camp. Sent to Vietnam, Joker applies to be a journalist, writing for the army’s Stars & Stripes magazine and therefore avoiding the need to kill anyone. Wearing a peace symbol on his hat, Joker is supposed to be the ‘hero’ of the piece, the one who firmly believes that violence isn’t the best solution. The problem is that Joker’s such an uninteresting character – one who wasn’t given a chance to develop in the first act because we were all too busy focusing on Leonard and the sergeant – that it’s difficult to care too much. In fact, with his condescending tone and constant John Wayne impressions, he’s actually not that likeable. Full Metal Jacket is an oddly paced film. Everything after that powerful first act feels like a collection of short, unrelated scenes that try to get across the sense of what it was like in Vietnam. 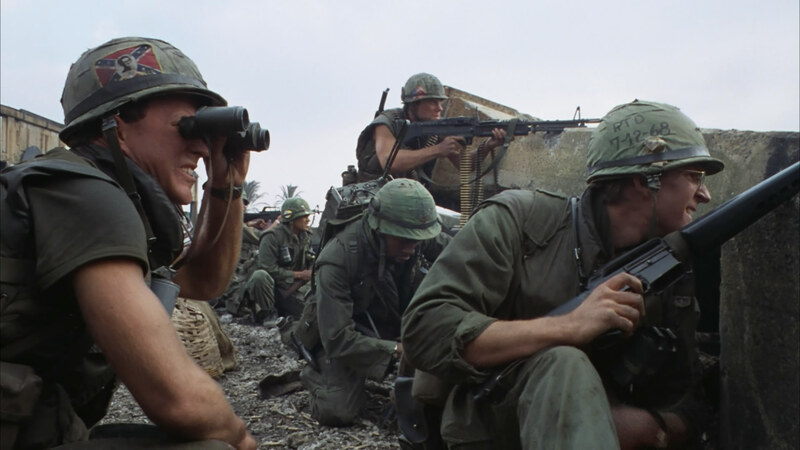 While the result is one that has to be commended – especially considering Kubrick never went to Vietnam and the entire film was actually shot in England – its plot suffers as a result of its bitty, structureless nature. 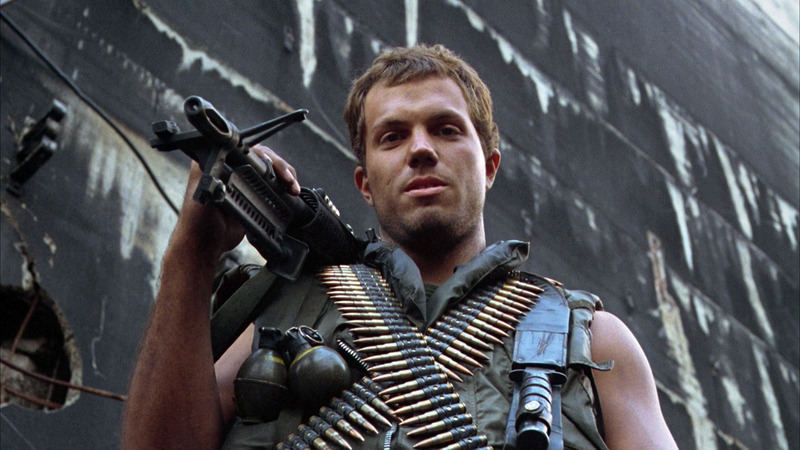 The above may sound like I don’t like Full Metal Jacket – this is far from the case. The film is at times harrowing, horrific, hilarious and heartbreaking, and though it isn’t Kubrick’s finest film (not when he has the likes of The Shining, 2001, A Clockwork Orange and Dr Strangelove in his repertoire) it’s still excellent. That said, it isn’t perfect, and while it opens with one of the strongest and most compelling first acts in cinema, it does lose its way a little in the second half when its two most interesting characters are promptly removed. A must-see? Absolutely. A brilliant war film? Without a shadow of a doubt? A stone-cold classic? Only just. As something of a classic, it should come as no surprise that Full Metal Jacket is readily available. Brits can get it as a standalone DVD or Blu-ray, both of which can be found very cheap. Alternatively, for a fuller Kubrick experience, you can go for the surprisingly affordable Stanley Kubrick: Visionary Collection Blu-ray set, which offers seven of his films for only £20. Amercians, your options are startling similar. You too have the option of a standalone DVD or Blu-ray, or the aforementioned Stanley Kubrick: Visionary Collection Blu-ray set, which will set you back roughly $50 in Americanialand. It’s worth noting that neither the UK or US box sets can be considered complete, as both are distributed by Warner Bros and therefore neither includes the Columbia-produced Dr Strangelove. By day I review video games for a living, but by night I'm doing this blog as a bit of non-profit fun, just so I can cover my other love: horror films and other generally weird movies. Each of my reviews come with screenshots and a trailer (or film clip) so you can hopefully judge for yourself if the film's worth tracking down. I've also made a New Year's resolution to watch all 72 video nasty films banned by the Director of Public Prosecutions in the UK in 1984, so the "Video Nasties" list you see above this will eventually fill up with reviews of each film. Naturally, many of these films contain scenes of graphic violence and the majority are rated 18 or 15 in the UK (while some even remained banned). If you are offended by such sights or bad language then this might not be the place for you because there may be the odd gory pic. I hope you enjoy the reviews in this blog: all comments are welcome, as are suggestions of films you'd like to see me review (just comment under any of my reviews and let me know). If you like my stuff, feel free to subscribe using the link at the bottom of this column to get email updates. Whack your email address into this little bugger and you'll get a handy email every time I stick up a new review. I'm nice like that.